Yoxxie has been designed to deliver rapid insights throughout the life of your event through its digital customer experience. 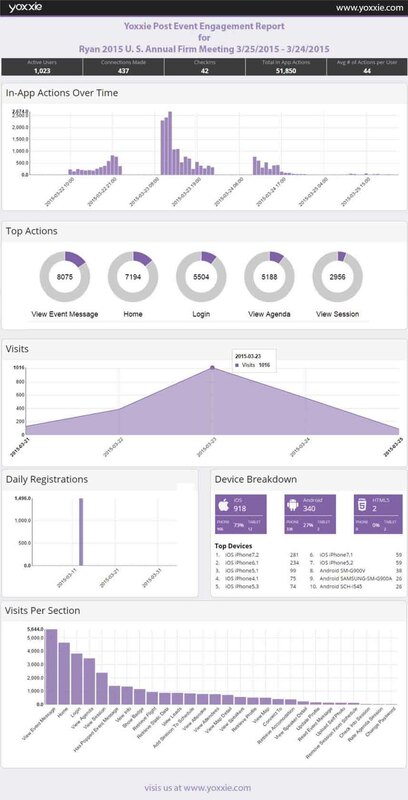 Your event data is being generated by attendees, sponsors, exhibitors, speakers, and sessions at all times. With a Yoxxie event app, we make it easy for planners to extract meaningful value from the event. AppFoundation is a professional services firm that provides custom web, mobile, and desktop application development. 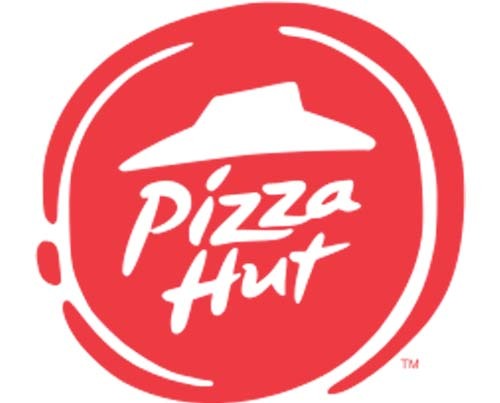 We leverage innovative technologies to deliver premium user experience that engages customers to drive satisfaction, brand awareness, and deliver measurable results. Yoxxie is a company that AppFoundation created based on digital transformation strategies to deliver quality software for the event industry that could deploy apps rapidly with the Yoxxie Mobile Engagement Platform’s business services. Yoxxie is a powerful platform that leverages omnichannel interconnectedness among touchpoints to integrate multiple mobile channels to one common integrated platform. The integration of many features to a common governing controlling application allows an enterprise to develop a series of applications in parallel; both for mobile and web. This framework is an enabler of change for an organization by providing a solid development methodology that breaks up large applications into small consumable API modules. • Schedule, speakers, sponsors, exhibitors, etc. Yoxxie was designed from the top down; from the website, the business model, the technology, and marketing. Yoxxie is a multi-tier application system consisting of mobile, web portal, backend, data warehouse, and database portions on an Amazon EC2 infrastructure. 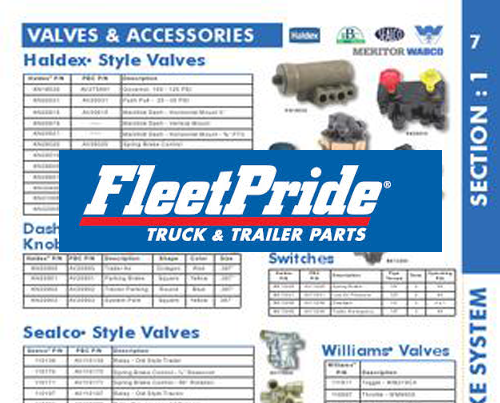 The results of a year-long project was the birth of a new business. 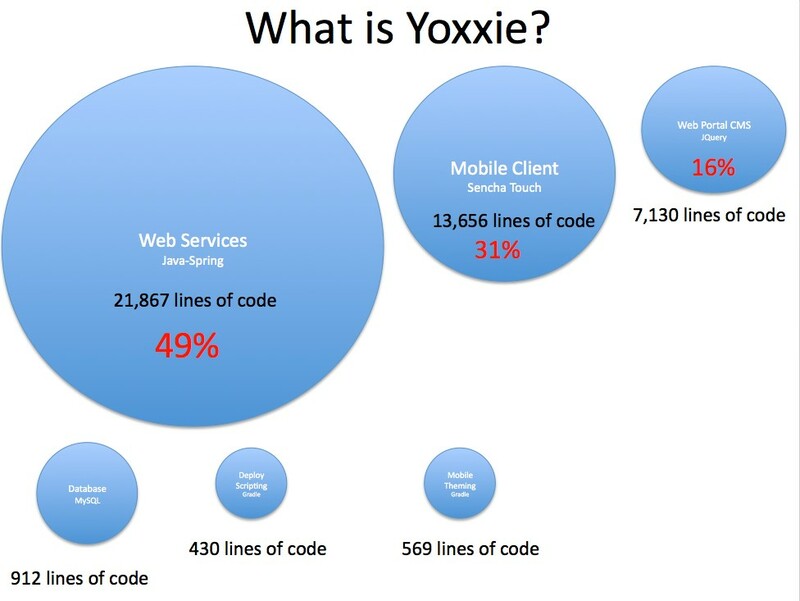 Yoxxie has successfully ran many events to support tens of thousands of users. And now, more than ever, people are paying attention to the data that comes from an event – not just how many tickets are purchased, but data from any communications around the event, how well the event is attended, if there are more popular aspects to the event than others, etc. 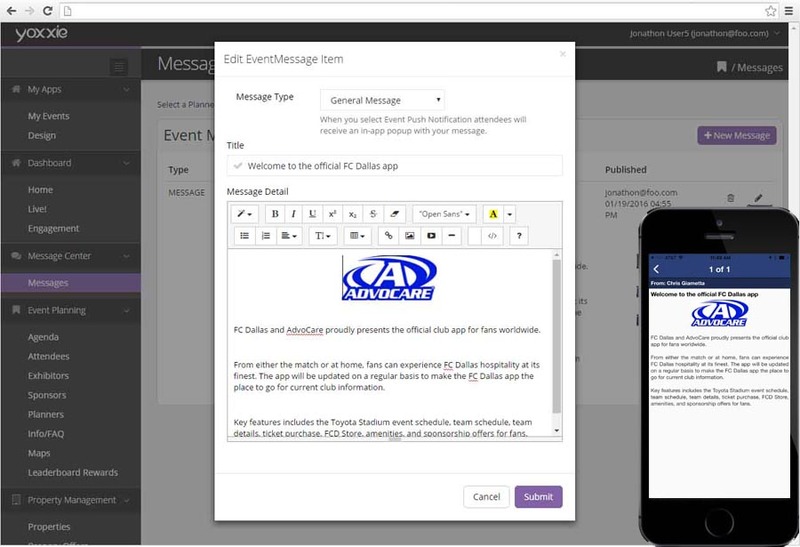 Yoxxie addresses the need for predictive analytics and mobile engagement around events. Yoxxie helps companies increase the value of their events by creating a technical foundation for mobile and web applications to operate simultaneously. The information gathered from these processes helps to expose data and results from events that are often overlooked. 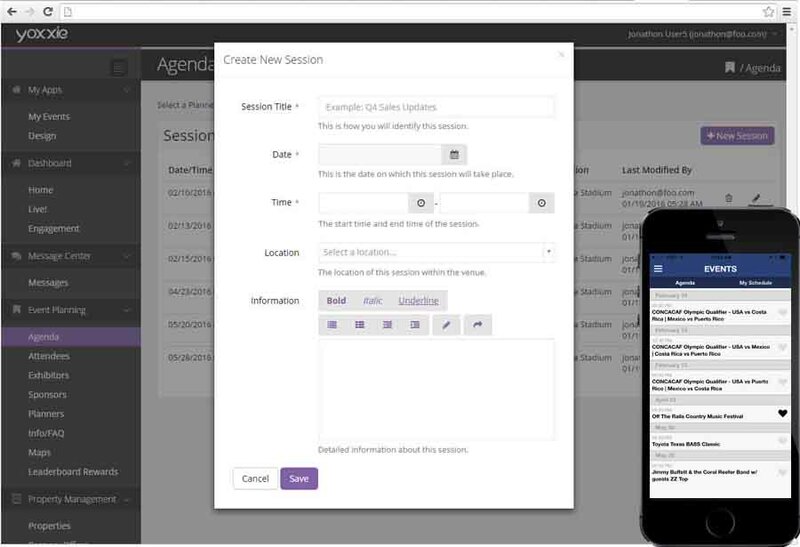 Personal Schedule & Check-ins: Users can add sessions to their schedule quickly. They can also check in and rate sessions in the session details. Speakers & Sponsors: Feature speakers so attendees can access sessions, bios, and connect. 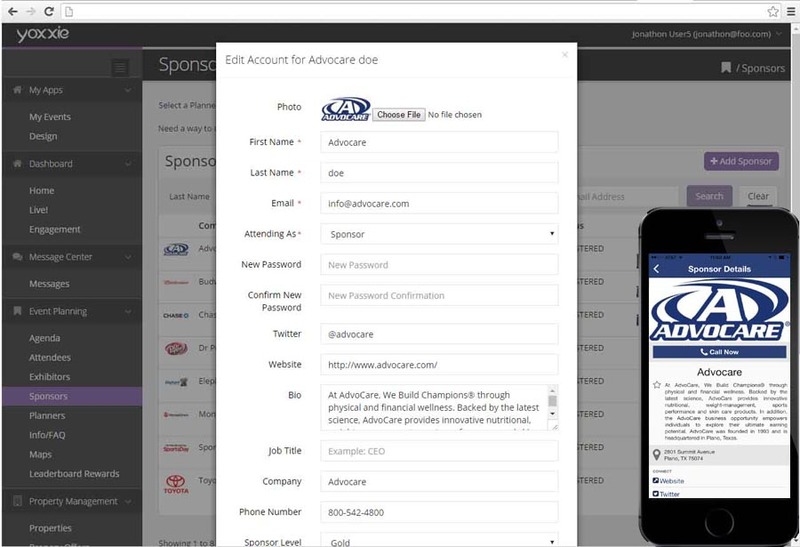 Allow sponsors to shine and generate extra revenue via sponsorship spots. Messaging: Whether you need to send a private message or post the entire event, we got you covered. Data sharing is a core philosophy at Yoxxie, we want to see you chattering away. We highly suggest you hop over to Yoxxie and start your event app today!